Social media rears its ugly head again, as it does on a daily basis. While this blog inadvertently dissects the ideology of the “far-left” due to their prevalence in technology, media, academia and the government, it’s time to analyze the rhetoric from the “far-right”. It goes without saying that the ideologues of both sides have fully narrowed their minds under their respective thick-walled echo chambers on social media. Facebook has explicitly chosen a side, and while Twitter has tried to as well, the “far-right” still mingle somewhat freely on that platform, as evidenced by the latest mob onslaught on Dr. Jordan Peterson’s account. This blog post will prove to be one that is very sensitive. It is a contentious topic that drives people to react emotionally rather than think rationally. It is what the far-left and right are most obsessed with: identity politics and race. But first, a quick commentary on the state of journalism and again shining light on how postmodern and cultural Marxist theory has crept in mainstream publications. The wage gap, however, persists. In Saskatchewan, for instance, a male with an apprenticeship certificate enjoyed a median income of $86,059, roughly $13,000 more than a female with a university degree. Somehow, the “wage gap” theory lives with yet another apples to orange comparison. Clearly ignoring the career path choices that everyone is free to choose based on their interests, skills and lifestyle, the median income gap between men and women (an unnecessary delineation) is emphasized here. The comparative error is there in writing: he’s comparing median incomes of tradesmen apprentices with female university graduates. How does such a glaring logical mistake make it in what is supposed to be objective news? What should be apparent by now is that when you align all the variables and ignore class identity, you cannot make a case for discrimination. That is, compare apples to apples. An engineering graduate (male or female) will make the same as another engineering graduate (male or female) that chooses to devote the same lifestyle. If one takes a significant leave of absence (maternal leave, e.g.) and the other is childless and has the extra ambition to climb the ladder by working eighty hour weeks, there will be a difference in income. It has nothing to do with gender and everything to do with choice. Forcefully and artificially closing the gap along discriminatory lines like gender removes that freedom of choice. Eventually if you continue along this trend of thinking and artificially close all “gaps” you will move away from a meritocracy and approach communism where every job type pays the same (that is, pays nothing, as the state will control all means and ends of production to make this Marxist utopia reality). Sociology, as with most social sciences nowadays, don’t exactly root themselves in logic and math. They are more interested in pushing ideology than objective analysis. You can be more “educated” at a university level in postmodern humanities courses, but measured in terms of practicality versus trades that provide the necessities of life (electricity, plumbling, construction, etc.) one clearly has a higher market value than the other and thus merits higher pay. The article goes on to talk about the aging population and immigration as a replacement to low fertility. While certainly opinionated about closing arbitrarily defined “wage gaps”, there wasn’t an attempt here to even ponder why it is necessary to artificially maintain population levels. He could have tried to analyze the root problem of Keynesian debt-fueled Ponzi schemes, lack of savings, and other poor economic choices as a result of massive government. However, if Jordan Press couldn’t even get past the “wage gap” with a rational outlook I would not expect any deeper thought about the inverted population pyramid problem. Now on to the sensitive topic that will surely lower my search ranking on Google. I’m bound to mention a lot of “faux pas” that will be flagged by Google’s censorious algorithms. This article also puts my personal safety at risk here by not choosing “sides”. The divisive environment sowed by social media has made being a neutral “fly-on-the-wall” observer a high-risk position, vulnerable to get swatted by either of the two mobs. An interesting phenomenon happened on Twitter last night on Dr. Jordan Peterson’s Twitter feed. Normally the receiver of flak for his opinions against collectivism from the radical left, he has received flak for his opinions against collectivism now from the so-called “alt-right”. The innocuous Tweet that started it all? To take in every perspective with an open-mind, it is important not to get caught up on circulating rhetoric but to take a step back and trying to see things rationally and from first principles. In this case, let’s point out some patterns and observations from the outside looking in to the group-think. It should be obvious without having to provide explanation that both fringes operate on collectivist principles. On the “left”, you are identified by class and ranked in terms of minority and victimhood status. These arbitrarily chosen classes to sow the seeds of division include race, gender, and the classical Marxist working classes (the old proletariat-bourgeoisie, the new 99% vs. 1%). On the “right”, you are also identified primarily by race. Both extremes are pushing for pride in their designated classes as a means to an end. Both result in segregation by their arbitrarily chosen strata. It is why “J hutch”‘s response Tweet is not surprising. While the “alt-left” and the “alt-right” are perceived to be opposites, they are in many ways the same. To provide some context to “Elsa Schtingheim”‘s response, Dr. Peterson uttered the exact same statement “Why would you be proud of […] the accomplishment of others” in response to the dangers of ethnic pride. The recurring “snark” that somehow passes as constructive dialogue on social media is meant to persuade casual observers to side with the “alt-right” mob mentality. We can observe more effects of the mob mentality and the resulting social media feedback loop, with the mob piling on 252 “likes” to help the persuasive clique garner more members. The use of “likes” passively threatens exclusion to impartial observers: “are you not with the popular opinion?” Social media’s “like” mechanism has moved debates away from facts and dialogue to high-school popularity contests instead. Further down the thread list we can see the other mob members piling on, overwhelming the dialogue with what essentially amounts to spam. Some will say it is tantamount to harassment. Rather, I see it more of an exposé of these Twitter mobs being unable to thoughtfully articulate arguments and instead relying on waves of rhetoric and dogma to bury rational responses. This is the destructive feedback loop cultivated by social media echo chambers. It is hard to keep an open mind if you are surrounded by hundreds of voices telling you to get in line with the mainstream opinion or else face mob justice. You know what you get called if you try to keep an open mind and consider all sides of this poorly conducted debate? A “radical centrist”! In this day and age, everything is radical. Nuance is dead. Is this why both fringes decide to attack Dr. Peterson because he refuses to take a side? Clearly the fringes are unable to dialogue with each other. The inevitable outcome of violence can be seen at various protest vs. counter-protest match-ups in recent past. Thus, the “alt-left” and the “alt-right” are meeting halfway and ganging up against those actually willing to listen and reason with them. They are trying to kill any remaining semblance of pragmatism and nuance. Let’s now address the touchy subject of race, primarily from the perspective of the “alt-right”, that is being pushed at Dr. Peterson. Identitarians focused on ethnicity within a nation rather than culture will miss the point that ethnocentrism is voluntary segregation. Segregation naturally encourages the closing off of dialogue between segregated groups, which allows superiority complexes to evolve, leading to the inability to associate with perceived “inferior” races. The identity politics played by the “alt-left” and “alt-right” are leading to the same problems. Ethnic ghettos unable to integrate into the prevailing culture of the host nation is what is causing violent no-go zones and other social problems in Europe. The issue isn’t solved with a mono-ethnic nation, but with a mono-cultural nation. In other words, multiculturalism and ethnocentrism are one and the same. Blind support of multiculturalism just segregates groups in a smaller geographic area relative to ethnocentrism. The argument made against Dr. Peterson is that showing pride in your family is showing pride in your race on a smaller scale. 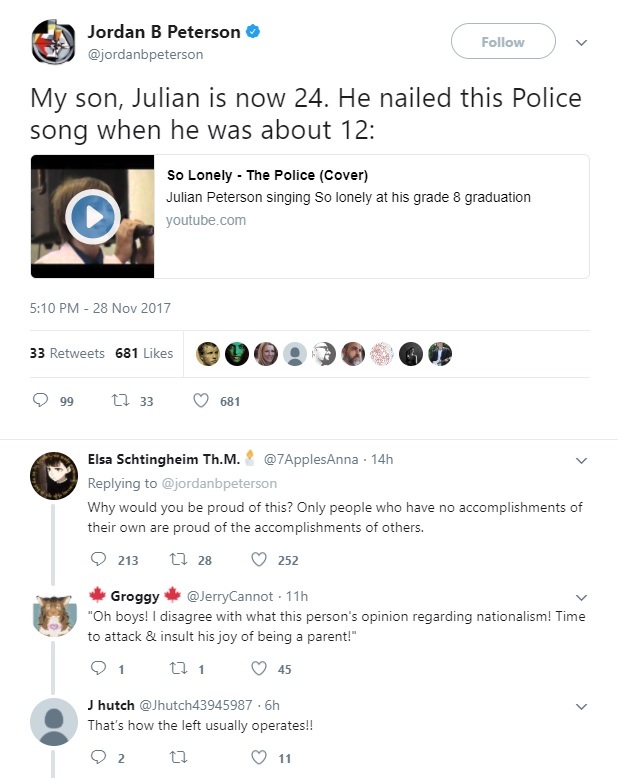 This is disproportionately attributing Dr. Peterson’s parenting success on the racial similarity of his son rather than a combination of genes, family values, cultural upbringing and the individuals themselves. That is, fatherly guidance had a significant contribution that led to his son’s achievements — something Dr. Peterson can rightfully take pride in. With an ethnocentric approach, if a family adopts a child of a different race and raises the child to become successful, can you be proud parents? What about children with parents of different ethnicity? If a nation successfully integrates people of different ethnicities to succeed under the predominant culture, is national pride still primarily based on race? In other words, nationalism is fine if you define a nation as a population adhering to a set of cultural norms and values, regardless of ethnicity. The way nationalism is sometimes criticized today is mistakenly conflating nationalism with ethnic pride and ignoring the culture of a nation. Suffice it to say that the “alt-right” is fueling that mischaracterization. At some point in time, everyone evolved from primates. Where along the lineage do you stop being proud of your ancestors because you now share the same ancestry of another race? A race is formed by populations living in a segregated area over a prolonged time, resulting in evolutionary biological differences to draw distinctions between groups of people living in different cultures and geographies. It follows that if you go back far enough in history, there would have been no concept of race. Thus, under ethnocentric theory, arbitrary points in time have to be taken to delineate between when one race has formed and when one race has not. There are no discrete lines here. Anyone who is proud of their race is picking a convenient point in time that gives definition to that race. For the time being, there is a correlation between ethnicity and culture in many parts of the world, but what drives societies and nations forward is the maintenance of culture and not a homogeneous gene pool. A homogeneous gene pool may make the maintenance of culture easier but is not a requirement. Transportation between nations and cultures is now quick, accessible and commonplace, but was not so for the majority of history (and thus a cause of the ethnicity and culture correlation). With emigrating individuals seeking a cultural fit rather than emigrating masses replacing cultures of their destination, the correlation between ethnicity and culture is expected to dissociate. Rather than using race as the indicator of an individual’s cultural values, we have nations and borders to differentiate that. One could argue that an ideal way to build a society today is to be somewhere in the middle: allow different ethnicities willing to work integrate and work together under a predominant shared culture. That is more nuanced than the extremes being advocated by the “alt-left” and “alt-right”. On one extreme, we have open borders. This scenario invites ethnocentrism (renamed multiculturalism) in the form of ghettoization by bringing in enclaves that have no will or chance to integrate into the prevailing culture. On the other extreme, we have completely closed borders, or immigration policy strictly on the basis of race. This also results in ghettoization, but now on a global scale. Psychologically, the isolation on the larger scale cultivates the same type of self-aggrandizing narcissism that you see on social media, causing an “us” vs. “them” mentality, rooted in the collective rather than the individual. Specifically it is “our race” vs. “their race”. Thankfully, as long as free speech channels are open on the Internet (and its users aren’t completely segregated in their separate echo chambers), and in a time where international travel is relatively widespread and quick, nationalism based on race is lower on the threat list of devolving into totalitarianism and violence than open borders, but that approach would still be based on misguided discriminatory principles. In the middle, controlled immigration can optimize the growth of a society. It would allow the strengths of different gene pools with a willingness to maintain a nation’s prevailing culture to work together. This moderate policy, now considered unthinkable by the social media mobs, was what historically helped western societies thrive in the first place. Disagree? Agree? Leave a comment, share and subscribe to the RSS feed. Previous PostPrevious post: With Bitcoin looking to break through $10K USD today, how would a future using just cryptocurrency look like?